In a blog post back in June, readers were introduced to the vision that newly elected President Mary Anne Williams has for the upcoming year in our guild. Now it’s time to learn some fun facts about her! I made my first quilt in 2005. I have always sewn, but never had an interest in quilting until some friends encouraged me to give it a go. My first quilt was a Christmas table runner made using Eleanor Burns’ Star for All Seasons pattern. My current favorite designer is probably Carolyn Friedlander. 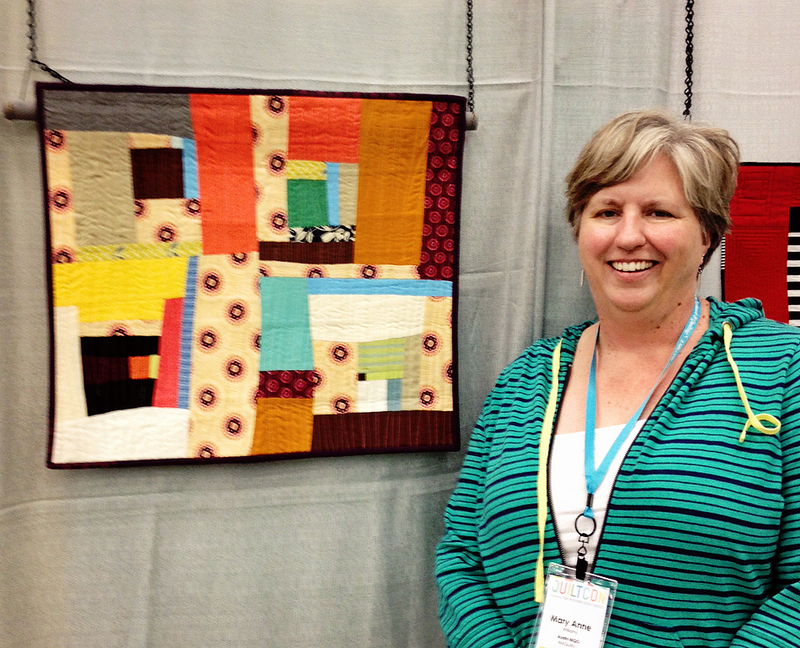 I wasn’t a big fan of Architextures until I saw “The Local Quilt” at QuiltCon. 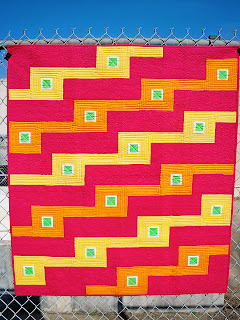 I was very interested in the quilt because a group of friends and I decided to do it as a group Block of the Month on Facebook. 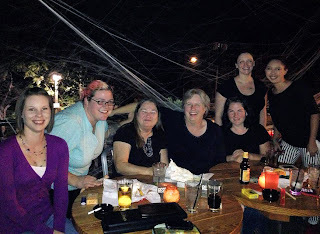 I met Carolyn at QuiltCon and she even joined our FB group! She is very genuine and sincere…I hope that she continues to enjoy success! I live out on 290 W and my closest LQS is Valli and Kim’s in Dripping Springs. Yesterday I saw a FB post that the reprint of Amy Butler’s Belle was in stock…so I ran in this morning and picked up some of the Duck Egg blue French print and some of the coriander in green and teal. Seriously, though…the coriander in fuchsia and white is one of my absolute all time favorites…it would have been nice if she had reprinted that too! I decide whether to machine finish or hand stitch binding depending upon how the quilt will be used…and my mood! I have two different machine binding methods that I use frequently but hand stitching is something I save for extra-special quilts. Slow and Steady – which is probably why I never finish anything! I’ve been a die-hard Warm and Natural user but I just finished quilting a large lap quilt that used Quilter’s Dream as the batting and I really like how it turned out. I like to piece with 50 weight cotton – usually Aurifil but I also like DMC. I usually quilt with Aurifil too, unless I happen to have a cone of So Fine in the color that I want. So Fine is a poly thread, it is very thin and blends great. 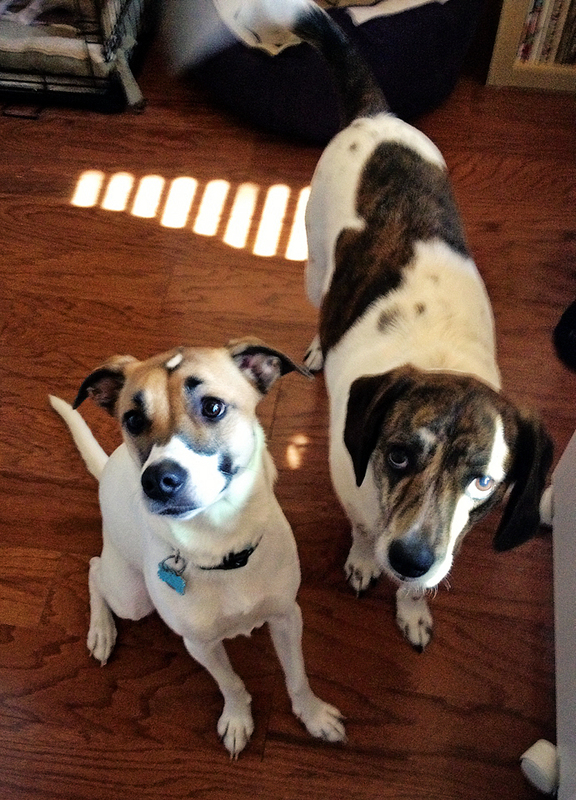 Dogs – I love them! ‘Occasionally Inspired’. I tend to be a pattern follower and I frequently make safe choices. Every now and then, I get inspired by something I’ve seen and I will push myself to go outside of my safe zone. Usually I’m very pleased with the end result. Mostly though, I am a pattern follower. I’d like to become a more confident paper-piecer. 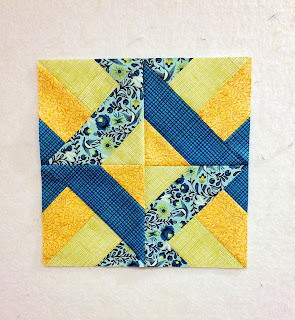 I’m on Month 5 of TheLocal Quilt BOM and I always seem to struggle…still! Wow…that’s a hard one. 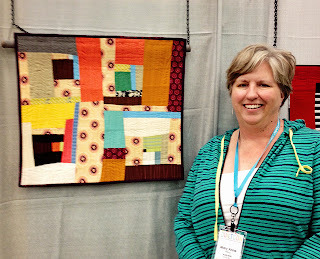 My first response was The Modern Quilt Workshop by Bill Kerr and Weeks Ringle of Modern Quilt Studio. I find their quilt designs to be very approachable and consistent with my aesthetic. They also use simple, efficient construction techniques to ensure a successful outcome. The Practical Guide to Modern Patchwork by Elizabeth Hartman is also a great book for beginners. My favorite blog? What a tough question! I really enjoy blogs authored by my friends so that I can see what they have been up to. 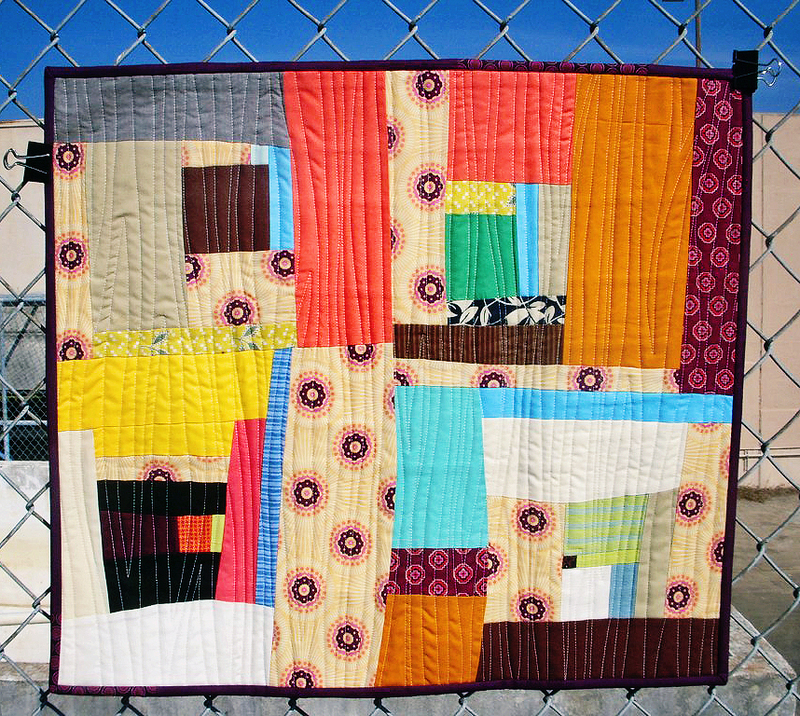 Teaginny Designs has a great blog – I don’t think I’ve ever not liked one of her quilts. She’s done some great work with Oakshott Cottons lately…LOVE! Check her out…and see if you can find the picture of the pillow she made with Laurie Wisbrun’s “Brrrr” fabric. OMG…cutest pillow EVER! 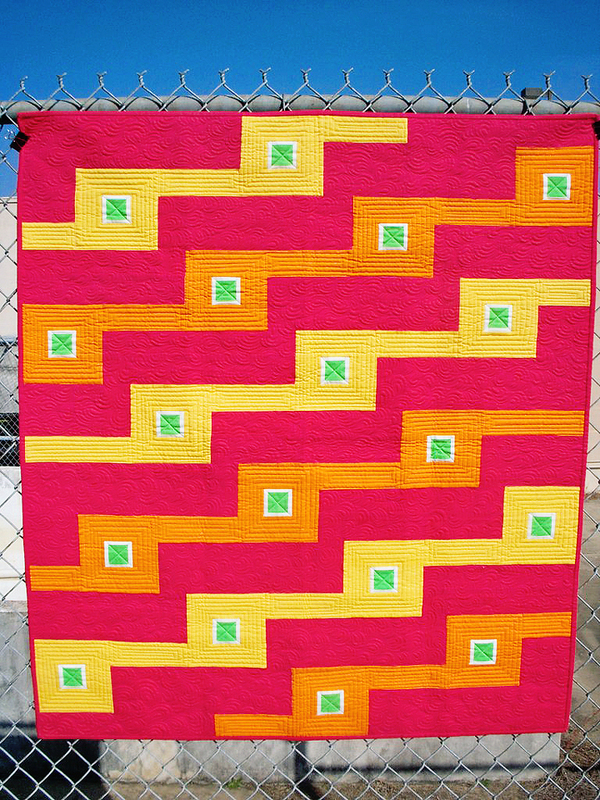 Wow…there are MANY quilts on my quilting bucket list. Perhaps I should just tell you what’s NOT on my list? That would be a Baltimore Album Quilt…I admire the skill and the patience to make them, but they’re just not my thing. Jacquie Gering! Jacquie is a teacher by profession and she makes quilts from her heart. She is dedicated to her craft and very encouraging. I am always inspired by her work and I think it would be fabulous if the Austin MQG could host her for a special event or two! What are you most excited about as you start your term on the Executive Council? I am SO excited to work with our great leadership team and members to bring programs and speakers to our guild who will share their love of Modern Quilting and inspire us to continue to practice and grow in the art. Did you know that I was in another MQG before I moved to Austin last year? I’ve probably never mentioned it…LOL! As a member of that guild I was part of a wonderful community of quilters who inspired, encouraged, welcomed and supported each other. Not just with their quilting, but with real-life issues as well. 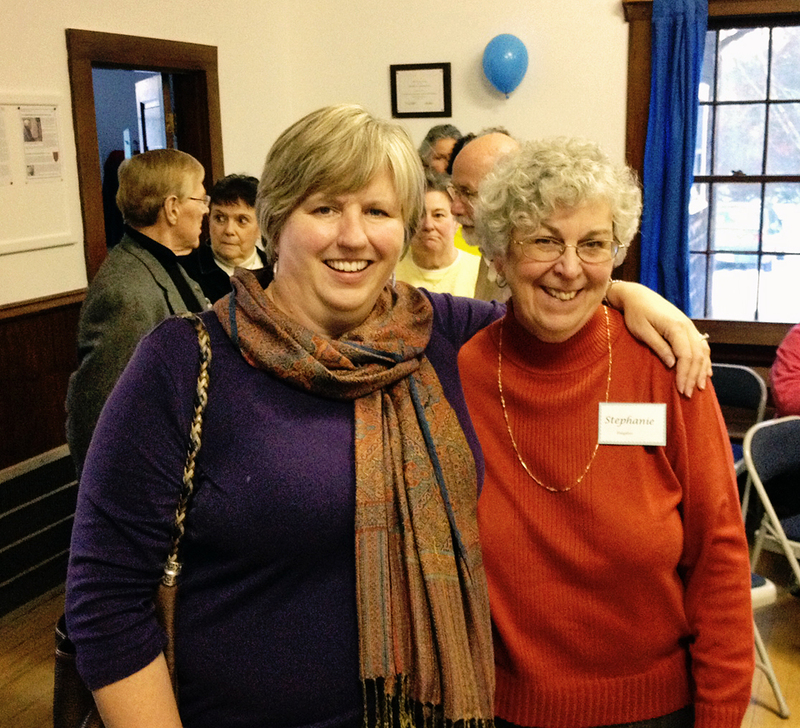 Members of all ages and all backgrounds shared their experiences to the benefit of all. Guild night is THE BEST night of the month and when we all get back to our homes, we can’t wait to sew! I know that we can build a special sense of community unique to Austin and I’m very excited to play a part in making it happen. Thank you for sharing with us, Mary Anne!